It is a commonly held perception that getting in shape and staying there requires hard work and hours upon hours of training. New research shows the opposite – it seems that only four minutes of vigorous activity three times per week is enough to be fit and healthy. Regular training improves maximal oxygen uptake (VO2max), which is a well-established measure of physical fitness. However, just how much exercise, and how intense that exercise should be to deliver the biggest benefit remains to be defined. Now, researchers from the KG Jebsen – Centre of Exercise in Medicine at the Norwegian University of Science and Technology (NTNU) in Trondheim have found that just three short high-intensity sessions (AIT) per week can make for substantial differences in the fitness of inactive men. "Our data suggest that a single bout of AIT performed three times per week may be a time-efficient strategy to improve VO2max", says Arnt Erik Tjønna, a postdoctoral fellow at the center and lead author of the study. Tjønna says one of the advantages of this approach is that it is easy for people to incorporate into their daily lives. The researchers measured changes in VO2max and traditional cardiovascular risk factors in 24 inactive but otherwise healthy overweight men after they completed a 10-week training session that involved three weekly high-intensity interval sessions. One group of 13 followed a protocol that has previously shown to be effective, consisting of four intervals of 4 minutes of high intensity exercise at 90% of maximal heart rate (HRmax) interspersed with 3 minutes of active recovery at 70% HRmax (4-AIT), commonly known as 4x4 training. The other group followed a protocol that consisted of one 4-minute interval at 90% HRmax (1-AIT). After training, VO2max increased by 10% in the group that had just one high-intensity session three times a week (1-AIT), while the group that followed the 4x4 regime increased its VO2max by 13%. Both groups saw decreases in their blood pressure, but the 1-AIT the group's blood pressures showed greater decreases than their 4-AIT counterparts for both systolic and diastolic readings. Tjønna says while the results look promising, the number of study participants was small, which limits the scientists' ability to extrapolate their findings. He also noted that people who are active probably won't benefit as much as the inactive participants did from the 1-AIT training regime. "It has to be noted that the subjects were previously inactive, and the same effect on physical fitness cannot be expected in active individuals," he said. "Nevertheless, since we know that more and more people are inactive and overweight, the kind of improvement in physical fitness that we saw in this study may provide a real boost for inactive people who are struggling to find the motivation to exercise." 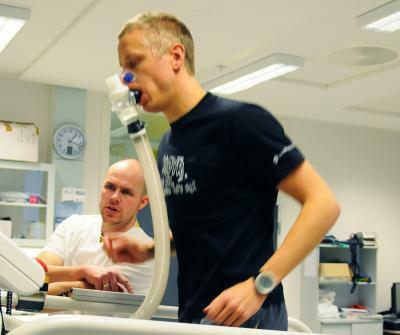 Arnt Erik Tjønna, (left) a postdoctoral fellow at the Norwegian University of Science and Technology's KG Jebsen &#8211 Centre of Exercise in Medicine, tests a healthy volunteer for his maximal oxygen uptake (VO2max). Tjønna was the lead author of a new article in PLOS ONE that shows that even inactive men can improve their fitness greatly from short bouts of high-intensity training.